A Mine Rich in Gems is a completely different company, run by Wei and Lili Shang and their daughters. I’m devoting this week’s post to their work because I think it is valuable (and because I’m a nice guy). Lili and Wei are creating 16-20 page full-color downloadable Feast Activities Workbooks for children ages 4-14. They have been at it for over a year, and are creating very useful and fun materials. Their first year’s workbooks were made available for free, but now they are ready for business, and are making them available for $2.95 each – with discounts for multiple downloads. I’m afraid their site is a little confusing, so let me explain how it works: First you sign up for their newsletter – which is free. About ten days before each Feast, you will get a notice saying that that month’s workbook is ready to download. Go to their website and take a look. You can even download the first and last pages of each workbook for free. If you like what you see, then put the full thing in your cart and pay the $2.95. Then you will receive an e-mail with a link so you can download the activities and print them out on your own printer. They are full color, but you can print them in gray scale to save money. Their site also includes an eclectic assortment of craft and display materials. Lots of fun. 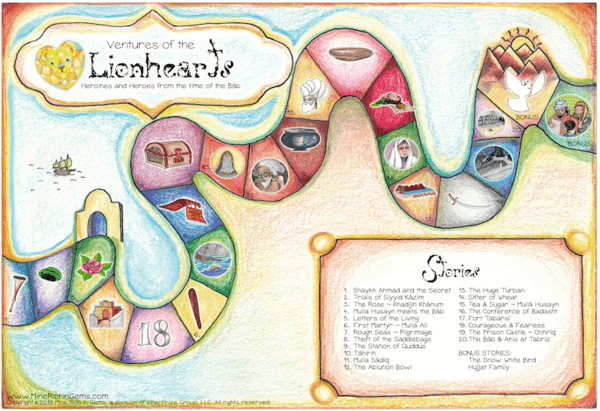 In honor of the Bicentenary of the Birth of the Báb, and during the year 176 BE, we offer really fun monthly downloadable workbooks for children ages 4-14 called, Ventures of the Lionhearts! Each story of the early heroines and heroes of the time of the Báb will be released each Bahá’í month, in a chronological order, for 20 issues (that’s 19 months plus a special Ayyám-i-Há issue). We just released our 2nd in the series for the 2nd month of the Bahá’í year, Jalál/Glory featuring a story of Siyyid Kázim and some of the trials he faced while sharing the good news about the coming of the Promised Ones. Last month, for Bahá, we started the 20-part series with a special story of Shaykh Ahmad and the secret he had regarding the Twin Manifestations of God! You’ll see that the first and last pages are offered for free. The whole set (from 16-20 pages each Bahá’í month) are offered for $2.95 per download. We hope you’ll appreciate this year’s volume of “19 Day Feast Pages for Kids” to support your spiritual education programs at Feast, in Ruhi children’s classes, junior youth groups, visiting neighbors/friends, learning how to study a prayer or quotation together and learn more about Bahá’í Teachings, History and the Fund, working together to solve a word game, reading the stories and acting them out together, creating a healthy snack and serving it to a new friend, learning new songs and singing them for each other and your neighbors, writing your own music, too! Please visit us at www.minerichingems.com to see our supportive and fun spiritual education materials!